Chen Yi was born to a wealthy family in Szechuan province, China, and was sent to study in France in 1919. There he met Chou En-lai and became a political radical, being expelled in 1921. He joined the Kuomintang in 1921 and became part of its Communist wing in 1923. He was part of the faculty at Whampoa Military Academy and fought in the Northern Expedition, joining the Communist Nanchang uprising in 1927. He fled to Mao Tse-tung's Kiangsi Soviet and became a close associate of Chu Teh. He was left behind by the Long March to help organize the New 4 Army, becoming its commander after the New 4 Army Incident of January 1941. 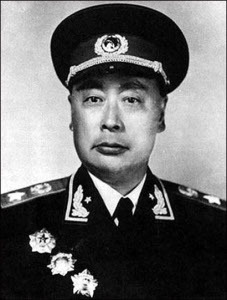 Chen Yi spent most of the Pacific War building up a trained force of 300,000 men. With the Allied victory in the Pacific and the renewal of civil war, he conquered Shantung province in 1948 and the Yangtze river valley in 1949, destroying the best Kuomintang field armies in the process and ensuring a Communist victory in the civil war.